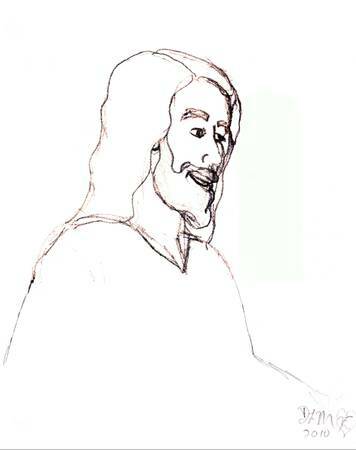 Sketch of Jesuson RedBubble; cards starting at US $1.92, matted prints US$28.50, prices subject to change. Just before Thanksgiving we had a light snowfall. The kids all headed outside to play in it and I took the camera out with them and got these shots of a couple rosebuds that were still on one of my rosebushes. The sunlight was just brilliant and made for some lovely shots. Despite the fact that these were taken the day before Thanksgiving, these made me think of a line in a Christmas song about a Christmas rose–so I did some looking online and found that Christmas roses are not actually roses at all. They are in fact a Helleborus Niger, which is a poisonous winter blossoming plant with a flower that resembles a wild rose. I had never before heard any of the folktales about the Christmas Rose but there are several here if you are interested in reading them. A pink rosebud, sprinkled with snow and sparkling white ice crystals, leans across a snow dusted patch of Oregon forest, stretching toward the wintry sun. Fine Art Prints from $10.44 and up. Prices subject to change. 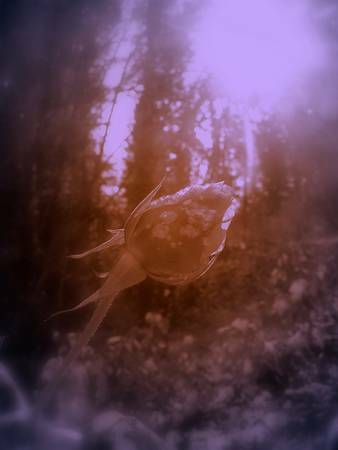 Lavender tinted photo of a pink rosebud, sprinkled with snow and sparkling white ice crystals, leaning across a snow dusted patch of Oregon forest, stretching toward the wintry sun. Bright winter sunlight glitters on this snow-covered rose in front of a dreamy Oregon forest scene. cards starting at US $1.92, matted prints US $28.50, prices subject to change. Bright winter sunlight glitters on this snow-covered rose in front of a dreamy Oregon forest. A softly focused scene of a snow cover road, house, and pale blue wintry sky is visible between the trees. 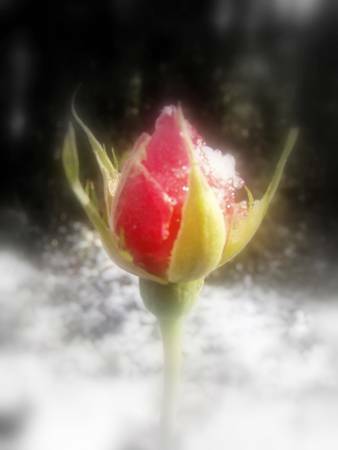 Covered in a thin layer of frost and snow this pink rosebud glitters in the winter sunlight in front of a soft background of snow-covered Oregon forest. Covered in a thin layer of frost and snow this pink rosebud glitters in the winter sunlight in front of a soft background of snow-covered Oregon forest. A frosty blue tinge lends to a feeling of magic in the air. 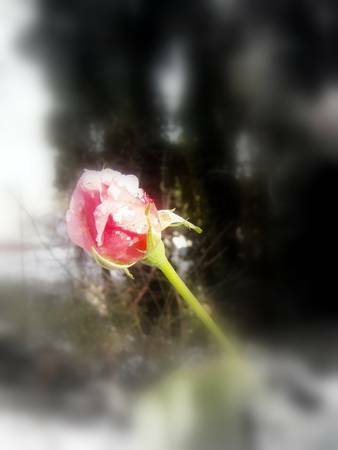 The winter sun begins to melt a sparkling layer of ice and snow on this pink rosebud in front of a dark green Oregon forest. A pristine layer of white snow seems to almost float in the background.